Once all of these practices were questioned by the masses. These men and women helped revolutionize their respective fields and push forward the idea of alternative medicine and new practices. While these practices were one time considered outrageous they are now readily accepted by most sources of medicine. 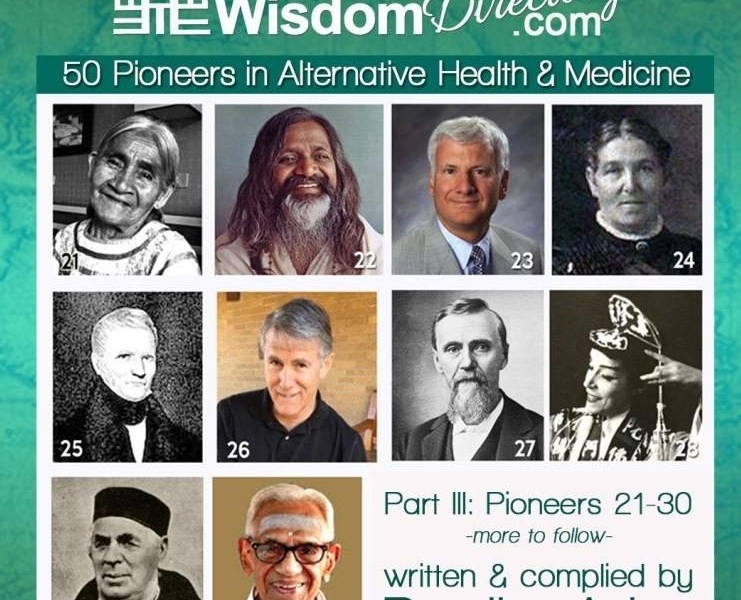 We celebrate the top 50 pioneers of Alternative Medicine. Sabina was a Mazatec curandera who lived in the Sierra Mazateca of southern Mexico. Her practice was based on the use of psilocybin mushrooms, such as Psilocybe Mexico. María Sabina was the first contemporary native shaman to allow Westerners to participate in the Healing Vigil that is known as The Velada. All participants in the ritual ingested psilocybin mushroom as a sacrament to open the gates of the mind. The Velada is seen as a purification and a communion with the sacred. In 1955, the US ethnomycologist and banker R. Gordon Wasson visited María Sabina's hometown and participated in the ceremony with her. He collected spores of the fungus, which he identified as Psilocybe mexicana, and took them to Paris. The fungus was cultivated in Europe and its primary ingredient was psilocybin. Youth from the United States began seeking out María Sabina and the "magic" mushrooms as early as 1962. In the years that followed, thousands of counterculture mushroom seekers, scientists, and others arrived in the Sierra Mazateca. By 1967 more than 70 people from the US, Canada, and Western Europe were renting cabins in neighboring villages. Many 1960s celebrities were rumored to have visited Sabina, including rock stars such as Bob Dylan, John Lennon, Mick Jagger and Keith Richards. Eventually, Sabina attracted attention from the Mexican police who believed her to be a drug dealer. The unwanted attention completely altered the social dynamics of her community and threatened to terminate the Mazatec custom, and Sabina was ostracized from her community. Mahesh was an Indian guru with a vast following, known for developing the Transcendental Meditation technique. He became a disciple and assistant of Swami Brahmananda Saraswati, in the Indian Himalayas. The Maharishi credits Brahmananda Saraswati with inspiring his teachings. In 1955, the Maharishi began to introduce his Transcendental Deep Meditation to the world. In 1959, he began his first world tour, writing: "I had one thing in mind, that I know something which is useful to every man”. The Maharishi is reported to have trained more than 40,000 other teachers and Transcendental Meditation technique to "more than 5,000,000” and founded thousands of teaching centers and hundreds of colleges, universities and schools. The first world tour began in Rangoon, Burma and included the countries of Thailand, Malaya, Singapore, Hong Kong and Hawaii. He arrived in Hawaii in the spring of 1959 and the Honolulu Star Bulletin reported: "He has no money, he asks for nothing. His worldly possessions can be carried in one hand.” That same year he began the International Meditation Society and other organizations to propagate his teachings, establishing centers in San Francisco and London. In the same year Maharishi trained Henry Nyburg to be the first Transcendental Meditation teacher in Europe. His 1962 world tour included visits to Europe, India, Australia and New Zealand. The Maharishi, his family and close associates created charitable organizations and for-profit businesses including health clinics, mail-order health supplements and organic farms. In the late 1960s and early 1970s, the Maharishi achieved fame as the guru to the Beatles, the Beach Boys and other celebrities. In 2000, he created the Global Country of World Peace, a non-profit organization, and appointed its leaders. In 1966, the Maharishi founded the Students' International Meditation Society ("SIMS"), which were established at over 1,000 campuses”, including Harvard University, Yale University, and UCLA. At the end of 1968, the Maharishi said that after ten years of teaching and world tours, he would return to India. 23. Dr. Joseph Pizzorno - Year: 1931-Present - Fields: Natural Medicine - Country: USA - One of the world's leading authorities on science-based natural medicine. A naturopathic physician, educator and researcher, Dr. Pizzorno is the founding president of Bastyr University. Under his leadership, Bastyr became the first fully accredited, multidisciplinary university of natural medicine. It is also the first NIH-funded centre for alternative medicine research. Dr. Pizzorno has authored many influential books and is the co-author of several landmark publications including the internationally acclaimed Textbook of Natural Medicine and the Handbook of Natural Medicine. He also co-authored Encyclopedia of Natural Medicine, Natural Medicine for the Prevention and Treatment of Cancer and Encyclopedia of Healing Foods. 24. Mrs Margaret Grieve - Year: 1858-1941 - Field: Herbal Medicines, Horticulture - Country: UK - Margaret Grieve was the principal and founder of The Whin’s Medicinal and Commercial Herb School in Buckinghamshire, England. Grieve possessed a litany of knowledge when it came to medicinal plants. As a member of the Royal Horticultural Society she provided experience in all areas of herb growing, collecting, drying and marketing. During WWI as supplies of conventional medicine dwindled, Mrs. Grieve produced numerous pamphlets explaining the use of specific herbs as remedies against common illness. In turn this helped solders to stay healthy without classic medicine, thus greatly aiding the war effort. Her 1931 publication A Modern Herbal is still a fixture today among herbal enthusiast. This timeless book has been recognized to this day as one of the best resources for information on medicinal herbs and plants. A Modern Herbal contains extensive information on the therapeutic, culinary, cosmetic and economic properties of herbal medicines. Margaret Grieve has been credited with re-establishing herbal medicines into Britain during the early 1900s and today her work continues to inspire herbalists and natural therapists across the world. 25. Samuel Thomson - Year: 1767-1843 - Fields: Herbalist - Country: USA - Thompson was a herbalist and botanist, best known as the founder of the alternative system of medicine known as "Thomsonian Medicine”. The system enjoyed popularity in the United States during the 19th century. It all began when Thompson sustained a serious ankle injury while working on the family farm at the age of 16. Despite consistent attention from medical professionals, Thompson’s ankle remained in critical condition. So Thompson used his extensive study of Roots, to make a root and turpentine plaster which helped heal his ankle. When Samuel became infected with Measles he turned to herbal medicine to cure himself. Thompson developed the Thompson System with the help of two doctors. It was based upon opening the paths of elimination so that toxins could be removed via physiological processes. This was not unique to Thomson, regular physicians used calomel, a toxic mercury-based compound, to induce vomiting and purgation. Thomson's more moderate and less toxic means to medicate attracted large numbers of followers. At that time, licensed doctors and many of their methods such as bloodletting came under intense scrutiny. Thomson's innovative system was presented as an appealing alternative that allowed individuals to administer their own treatment using natural products. Thomson's movement had affected more than a million Americans and started a medical reformation that would not peak for another 50 years. The brightest medical minds of the time were split vehemently both against and for Thomson's right to practice. Because of the success of Thomson and his followers, states began regulating medical practices along party and class lines. Hanley is an American microbiologist known for using an experimental gene therapy to improve health span. Hanley holds a PhD in Microbiology from University of California, Davis. In 2009 he founded Butterfly Sciences in Davis, to develop a gene therapy to treat HIV using a combination of GHRH and an intracellular vaccine. He has numerous articles and academic publications in epidemiology, biotechnology, and economics. Hanley said he corresponded with the FDA prior to starting his self-experimentation, and the FDA told him he needed to file and get approval for an Investigational New Drug (IND) application before he tested the plasmid on a person; not having obtained an IND, he proceeded without it.The plasmids were administered twice: once in summer 2015 and a second larger dose in July 2016. Andrew Still was the founder of osteopathy and osteopathic medicine. He was also a physician and surgeon, inventor and Kansas state legislator. He was one of the founders of Baker University, the oldest four-year college in the state of Kansas. At the time Still practiced as a physician, medications, surgery and other traditional therapeutic regimens often caused more harm than good. Some of the medicines commonly given to patients during this time were arsenic, castor oil, whiskey and opium. Additionally, unsanitary surgical practices often resulted in more deaths than cures. Still founded the first school of osteopathy based on this new approach to medicine, the American School of Osteopathy (now A.T. Still University) in Kirksville, Missouri in 1892. Osteopathy set standards in sterilization, surgical practices and other client based procedures. Sophia Delza was a modern dancer, choreographer, author, and practitioner of Tai Chi, which she taught at her school in New York City. She authored the first English language book on tai chi, T'ai Chi Ch'uan: Body and Mind in Harmony. Through her books, articles, lectures, and television appearances, Delza promoted the practice of Tai Chi for health and fitness. Delza was one of the earliest popularizers of Chinese martial arts in the United States. In 1954, she gave the first documented public demonstration of Tai Chi in America, at the Museum of Modern Art. That same year, she founded the Delza School of Tai Chi Chuan at Carnegie Hall and began teaching Tai Chi as a form of exercise at the United Nations and the Actors Studio. Tai Chi often looks more like slow yoga than judo or karate-two martial arts that involve kicking and grappling. Many people practice Tai Chi as a gentle exercise, without any interest in its martial component. Yet the practice has been translated as “supreme ultimate fist” and “great extremes boxing.” As practitioners like Sophia Delza understood, Tai Chi’s slow pace represents control. Mastering the movements allows practitioners to develop strength, balance, and a unity between mind and action. Chiefly known for his contributions to hydrotherapy, A Bavarian priest named Sebastian Kneipp, began the Nature Cure movement in 1890s. Initially Kneiff was inspired by Vincent Priessnitz, a peasant farmer of the Austrian Empire. While serving as the confessor to the monastery, he began offering treatments of hydrotherapy, botanical treatments, exercise and diet to the people who lived in the village. Kneipp began developing his healing methods in 1849 after contracting tuberculosis and experimenting with the water treatments developed by Sigmund Hahn. After being ordained in 1852, he continued to experiment with water treatments in his parish. Kneipp’s theory asserts that an imbalance in the blood is the root of disease. Kneipp also dabbled in other fields like botanical medicines, exercise, nutrition and balance. His suffering early in life caused him to develop a deep sympathy for those less fortunate than him. Kneipp expanded the definition of health to include a more holistic view which included mental, social, and spiritual aspects. In 1891, he founded Kneipp Bund, an organization that promotes water healing. In America, Kneipp Societies were founded, which, under the influence of Benedict Lust and changed their name to Naturopathic Society of America. Today there are 600 organizations that are a part of Kneipp Worldwide. Warrier is a renown Ayurvedic physician. He is the chief Physician and Managing trustee of Arya Vaidya Sala. Their objective is for Ayurveda to be internationally recognized as a scientific system of healthcare. Since Warrier’s time there, Arya Vaidya Sala has become a premier destination for scholars, students and patients. Over 800,000 people a year benefit from free consultations at the hospitals. While practicing Ayurveda as a scientific system of healthcare, he also acknowledges the validity of systems in other fields. He has guided the growth of the Vaidyaratnam P.S. Warrier Ayurveda College for over two decades. He has served as Dean of Ayurveda Faculty, Calicut University and Chairman of its Board of Studies. He was twice elected as president of the All India Ayurveda Congress, once in 1981 and again in 2003. Warrier has helped establish an efficient quality control laboratory to test and certify both raw materials and finished products. A serious advocate of medical ethics, he strongly disapproves all tendencies for medical practitioners to exploit people’s ignorance. He has opposed all trends to commercialize Ayurveda, never compromising his principles.